You’d think that in 2009, when global networks are handling exabytes of data in a single day and OC192 fiber optic connections crisscross the planet, the FCC — the most important communications agency in the United States — would at least be able to use modern technology to stream its own public meetings. Nope. 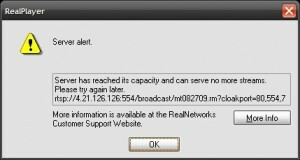 The FCC is still streaming its webcasts with RealPlayer, a horrendous and arguably obsolete application that fell out of favor with techies years ago and has since been overtaken by superior streaming platforms like Adobe’s Flash Media Server. Today’s big tech news item is the FCC’s “three-pronged probe” of the wireless industry, which was set to be announced today at this morning’s Open Commission Meeting. Want to watch the FCC’s meeting and see what our “public servants” in Washington are up to? Good luck. The FCC’s streaming video server only supports 200 simultaneous connections. In a nation of 270 million wireless users, why not offer, say, 1000 or even 10000 connections? Given the agency’s $339 million dollar budget that’s not too much to ask, is it? It’s especially ironic that the FCC still struggles with streaming webcasts given that the FCC is launching an investigation of alleged “anti-competitive” practices in the wireless industry. Why isn’t the FCC investigating its own inability to accomplish relatively simple tasks, like stream live video or run a halfway decent website? The FCC doesn’t just use RealPlayer for Open Commission Meetings. Even the FCC’s “Broadband Workshops” — which are supposedly going to guide the future of broadband deployment in America — are using the same tired streaming platform. Of course, in the grand scheme of things, the platform the FCC uses for streaming video isn’t all that important. But it is a much-needed reminder that bureaucrats in Washington aren’t very good at keeping pace with modern technology. Unfortunately, many seem to have forgotten this fact. ADDENDUM: Turns out the FCC does use a modern platform for streaming open commission meeting, Cisco Webex Webinar (accessible via www.broadband.gov) but only offers RealPlayer streams on the official FCC.gov website. Also, once meetings are finished, they are available online exclusively in the Real video format. Next post: Texting While Driving: Regulate or Empower & Educate?